Synopsis: As usual, Rice dominated the competition. He won in all the major categories, barely breaking a sweat. But the Hall of Famer couldn't win the final round, when Breech squeezed his tiny size 7 kicking foot into a size 5 shoe because he thought it gave him better accuracy to get the ball between the uprights. 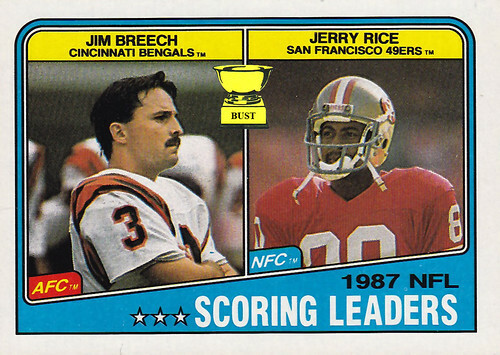 Speaking of getting things "between the uprights," did we mention Rice scored a lot more than Breech? Postscript: Wow, 100 Football Fridays. To think, when Football Fridays started the Internet didn't have nearly as much crap clogging it up. It has been a long trek, but don't expect the self-serving slop to stop focusing on the big guys in pads and helmets. Hut, hut ... hurl.